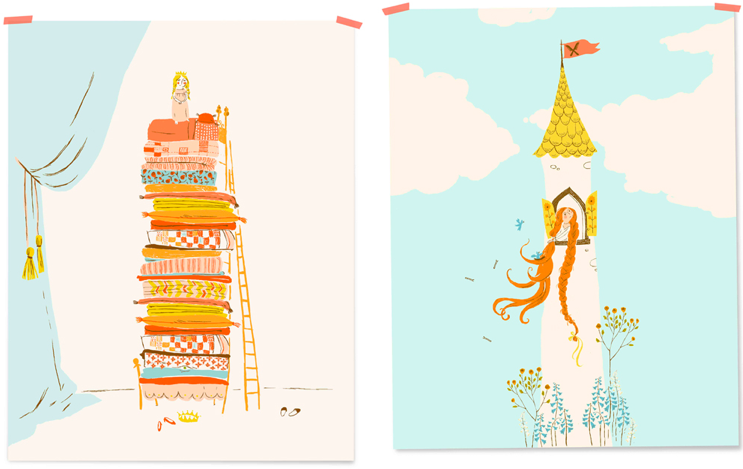 A few lovely little markdowns have crossed my path this morning, friends…thought you’d want a heads-up. It’s Friends & Family time at Kiehls – which means it’s time to stock up on sunscreen (and their amazing new BB cream, which I’ll be telling you about next week). Take 20% off sitewide with code FAMILY through 6.17. 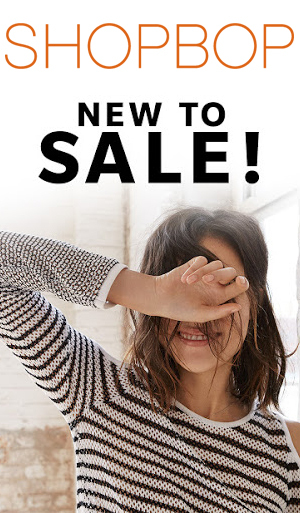 Piperlime just launched its designer sale, and while I still can’t ever seem to remember they carry clothes, they have a great selection of Vince, Jenni Kayne, Rag & Bone and the like marked down 40%. Well worth a scan. Alexis Bittar released a bevy of summer markdowns, so there’s an excellent selection of bling marked 30% off. I’m particularly loving this rose gold collar necklace…very tempting. More Friends & Family goodness going on at John Robshaw – take 25% off sitewide through 6.14 with code JRFRIEND. If you’ve been eyeing one of his light-as-air blankets (truly, there’s nothing like it in summer), now’s the time. The James Perse private sale is going strong…loads of great summery layering pieces, maxidresses and the like, marked down to prices you’ll actually consider paying. Any killer deals on your radar today? Share with the class! This entry was posted in coupons and discounts, deals and tagged alexis bittar, james perse, kiehls, piperlime on 13 June, 2013 by shoppingsmycardio. Friends & Family at Saks! A whopping 25% off (20% off jewelry) through 4.28.13 with code FRNFAM2. This is the time to splurge on that Burberry trench, friends. Or maybe those Rag & Bone boots you’ve been eyeing for a year and a half. Shop fast, the good stuff will go early. J.Crew: In what is fast becoming totally predictable news, J.Crew has 25% off sitewide again through 4.28.13 with code SPRINGBEST. Cardmembers can make it 30% off with code CARDSTYLE. Their sweaters aren’t what they used to be, and their pants only fit 5% of the time. But this may be a good excuse for a new classic button-down and some denim shorts. This entry was posted in coupons and discounts and tagged j crew, piperlime, saks on 22 April, 2013 by shoppingsmycardio. Editor’s Note: My helpful hints today on iVillage are all about navigating Black Friday – when to dive in, when to bow out, and how to prep for battle. In that spirit, I thought I’d have our Sale Spy, Roxanna, give you some tips on my retail Achilles’ heel: the clearance store! I have yet to master these bargain bastions, but now that I have her tricks in hand, I just may give it another try! Roxanna K.K. ~ Everyone can shop in ritzy boutiques. With their racks of carefully edited merchandise and judicious use of white space, they’re a piece of cake. But only die-hard sale hounds can shop at clear-out retailers like Marshalls, Nordstrom Rack and TJ Maxx. This is where you become a shopping ninja. 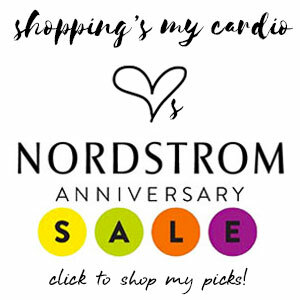 This entry was posted in deals, guest posts, sale and tagged anthropologie, piperlime, steve madden on 19 November, 2012 by shoppingsmycardio. I didn’t set out to look for pieces in this beautiful, almost-jade, not-quite-kelly grass green hue. In fact, I didn’t even realize how perfect the match was until I noticed both windows open in my browser. But I haven’t been able to stop myself from daydreaming about this color ever since. It’s the perfect summer shade, don’t you think? Even though it’s polyester, I’d love to see that top paired with a pair of denim cutoffs or a bright yellow skinny jean. And those shoes? Well, what wouldn’t they be amazing with? Pink comes to mind…something pale like strawberry ice cream or bright like raspberry sorbet. Really, you couldn’t go wrong. Darn it, now I’m craving ice cream. 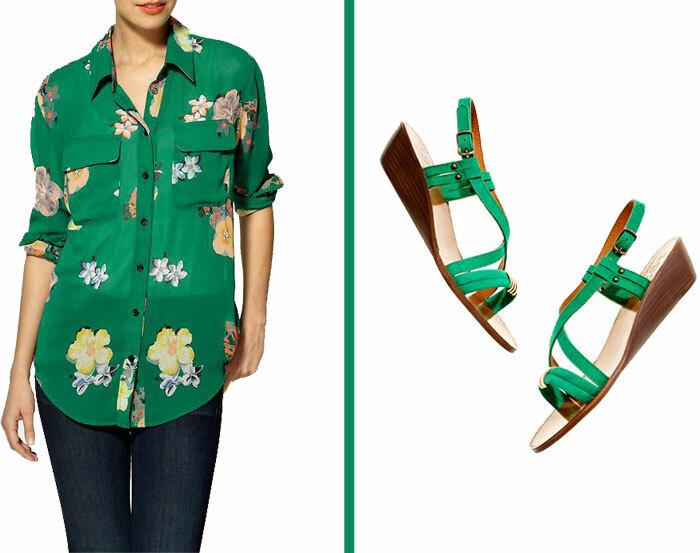 This entry was posted in fashion, styling, summer and tagged madewell, piperlime on 5 June, 2012 by shoppingsmycardio. Happy Friday, friends! As usual, there’s no rhyme or reason to this week’s list, though I am noticing an abundance of ultra-bright color. It must be summertime. The hubs and I have some fun travel plans over the next few months, and I can tell you there’s nothing I’d rather be toting my travel gear in more than this bold blue weekender bag. I love the bright hue, the tribal vibe and the leather trim, and I have a feeling it’d be light as a feather. It’s still a little early to be thinking fall trends, but this ladylike silk blouse from Madewell will be just the thing with those below-the-knee skirts this fall. 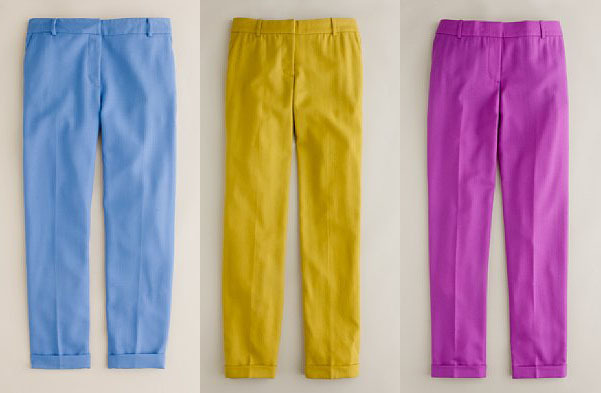 …I can’t stop thinking about adding a chic pair of bright pants to my denim-centric wardrobe. While I’m normally terrified by the idea of a capri, these candy-colored versions from J.Crew look more like an ankle-grazing length than a mid-calf affair, rendering them infinitely more stylish. Now, to pick a color! And, now that I think about it, that emerald blouse would look pretty amazing with any of these – especially the blue. Be bold, friends! While I was never a big fan of Gretchen Jones while she was on Project Runway, I have to admit that her new line of jewelry for Piperlime is good. A lot of the pieces miss the mark by *that* much (a spiked earring that would be so much more amazing if the post weren’t dead center, and a long necklace that would be strikingly perfect if the pendant pieces were a bit further down the chain), but there are some styles I’m seriously contemplating. But…no returns allowed on these pieces, so I’m proceeding with caution. And now, I’m off to spend a fun, relaxing weekend with my BFF, who’s coming to town. I can’t wait! Hope you have something equally fun in store. 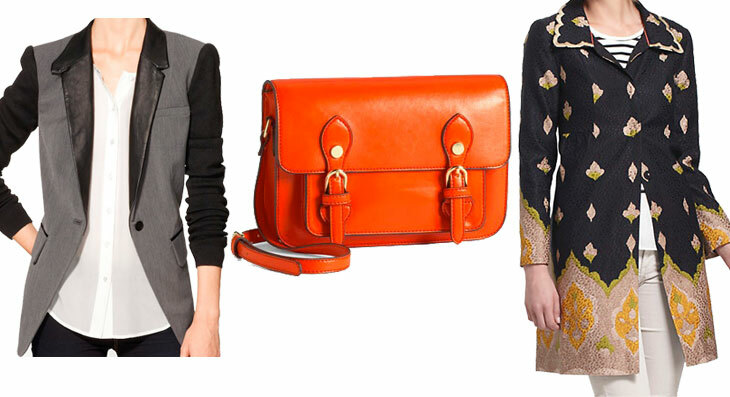 This entry was posted in fall, fashion, friday finds, handbags, jewelry, travel and tagged gretchen jones, heather ross, j.crew, madewell, piperlime on 5 August, 2011 by shoppingsmycardio. happy friday, everyone! i don’t know how things are looking where you are, but it’s been a whirlwind week of weather here in portland. we went from blizzards yesterday to clear blue (and sunny!) skies this morning. and so, i’m holding on to the hope that winter was just getting one last blast out of its cranky system, and praying for warmer days ahead. speaking of spring, we can finally start looking forward to a higher waist, and a wider leg on our denim this spring. can i get an amen?! this pair of jeans popped up in my shop it to me alert (if you’re not trying it, you really should) this morning, and they’re definitely worth pointing out. now, i don’t pick favorites when it comes to my denim…it would be like choosing a favorite child shoe. but i can say with confidence that these paige hidden hills in twilight are the most comfortable jeans i own. that’s not true of all of the hidden hills jeans (i have a few) – just this particular wash. it’s due entirely to the fabric blend, which contains almost 20% spandex. in other words, they’re essentially yoga pants you get to wear out on the town. and now they’re on sale at piperlime for $119. i’m seriously considering a back-up pair. i’m still not totally on board with madewell…i’m annoyed that a brand that’s supposed to be a younger, cheaper version of j.crew is every bit as pricey, and i’ve had mixed luck with their pieces thus far. but i am swooning so severely over their fernwood dress, i’m either going to lose consciousness or gain credit card debt. one look at it, and i can hardly wait for spring. as a rule, i tend to be skeptical of most clothing/accessories you can buy at macy’s (oh, the snobbery!). but i spotted this rachel roy necklace in my worldwide wandering this week, and i’m a fan. it’s a nice middle ground between last season’s gargantuan statement necklaces and the itty bitty pendants you’ll be seeing everywhere for spring, which makes it the perfect piece to buck the trend without going overboard. and, speaking of jewelry, i can’t head off for the weekend without showing you christine mighion’s new weekend collection. i love all of her designs, so it’s no surprise that i love this collection too. it feels so casual, comfortable and clean – just like a perfect weekend. and there are styles under $100, which is seriously remarkable from a fine jewelry designer. This entry was posted in denim, fashion, friday finds, jewelry, spring and tagged christine mighion, madewell, paige denim, piperlime, rachel roy on 25 February, 2011 by shoppingsmycardio. deal of the day: 30% off at gap & co this weekend! here’s some exciting friday news: gap is running its annual “give and get” event this weekend, in which you get 30% off at old navy, gap, banana republic and piperlime (this is a new, and very exciting addition!). plus, for every dollar you spend, gap donates 5% to one of several associated charities, and you get to choose which charity. just head to the give and get website, sign up, choose your charity, and get shopping – use your discount online or in-store, as many times as you want! while all of the charities are amazing, i’m going with the global fund, which works to eliminate AIDS in africa. last year, gap was able to give $585,000 to the global fund via the “give and get,” so you’re definitely shopping for a worthy cause. so, get signed up, and let me know what you’re buying! i’m still stuck in piperlime heaven, deciding just how many shoes i can reasonably justify. but i’ll be on to old navy next…time to stock up on some necessities. This entry was posted in coupons and discounts and tagged banana republic, gap, old navy, piperlime on 13 March, 2009 by shoppingsmycardio. i am not a boot girl, or a heels girl, or a (gasp) athletic footwear girl. i may love them all in theory, but the reality is that i wear flats. every day, rain or shine, my go-to shoe is the ballet flat. however, now that i’m living in a much brisker climate, i think it’s time to admit that i may have to turn in my flats for the winter, in favor of something a touch more weather-friendly. but, as i’m also living in a much less fashion-forward climate, none of my heeled boots are going to do the trick either. so, i’m faced with the dilemma of purchasing potentially very expensive footwear that i know may never actually leave my house. but i want to give it a go. what i want: these amazing taupe riding boots at barneys (left, $480) are calling my name oh-so-seductively…as are these equally stunning grey belted boots (center, $480) from coclico (the pics at shopbop are vastly superior, but the price is lower at piperlime, so they win). what i bought: for now, i’ve taken the hubs’ advice, and picked up a pair that’s more budget-friendly (cough, cheaper, cough) to test my fashion flexibility. these cognac suede boots (right, $133 after discount) remind me a lot of the classic campus by frye, but at less than half the price (especially when you factor in the $25 discount AND the free vogue subscription with purchase promotions at endless right now). this way, if i manage to make the style work for me, well, it’s splurge-city, baby. This entry was posted in fall, shoes and tagged barneys, boots, coclico, endless, frye, piperlime on 30 September, 2008 by shoppingsmycardio.